Our Future Rooted in Our Past: Who Is That In The Picture? One of the treasures for genealogists or family historians is the identification of family members in photographs. How many of us have boxes or digital folders on our computer of unidentified pictures? Working on labeling and organizing pictures can be a daunting process, but if completed is small segments of time it becomes more manageable. I would recommend identifying the individuals in photographs as soon as possible. The reason being that over time we forget the particular circumstances and the names of the individuals in the pictures. This is evident from the numerous websites like Dead Fred where people post pictures in hopes of finding someone who is related and can identify those photographed. Maureen Taylor has developed a website and thriving business of helping others analyze the mysterious pictures that they have received from their cousins, aunts or other family members regarding ancestors. She offers a service that will help you to identify the place and time period of the picture by evaluating the background, dress, and the way the photo was processed. Ms. Taylor also offers services to locate old family photos, paintings or engravings. She also provides you hints and tips regarding the storage of your prized photographs. Ms Taylor is a noted author and regularly contributes to Family History Magazines such as Family Tree and Ancestry with links provided on her website to articles regarding identifying family photographs and many other topics. 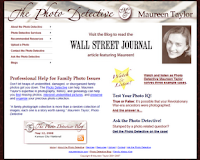 If you would learn more about the services that Maureen Taylor offers click PhotoDetective. Make sure that you take a look at her PhotoDetectiveblog and The Last Musteras well. They will provide you with interesting information regarding photography and the current project that she is working on in collecting photographs from the Revolutionary war generation. I know that you are wondering about whether or not that photography was even possible that early, but if you want to listen to a podcast with the Genealogy Guys, she discusses the possibilities of these older photographs. To listen to the podcast click Finding the Revolutionary War Generation. Thank you so much for mentioning my website and blog! Have you seen my video podcasts yet on Vimeo and YouTube? I like the focus of your blog.